Whether you're a parent hoping to bring joy to your child with their dream LEGO set, an adult who enjoys taking a break from stressful everyday life by completing a model, or an avid collector, you've probably experienced the difficulty of trying to hunt down your desired LEGO set, especially if you live outside the US. 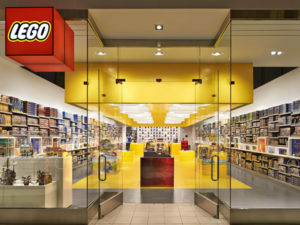 Most of the most exclusive sets are available at the US Lego store, but they do not ship internationally. We're here to help with that. Here are some of the coolest LEGO sets you'll want to get your hands on through our service. 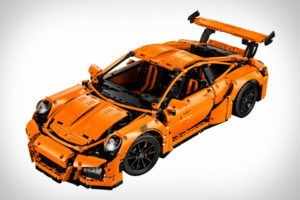 This LEGO Technic model available in the USA features authentically designed aerodynamic bodywork, adjustable rear spoiler, headlights and taillights, red suspension springs, original-design rims with RS emblem, detailed brake calipers, low-profile tires, working gearbox, working steering wheel with gearshift paddles, detailed seating, a glove compartment with unique model serial number, opening doors, an opening hood containing a suitcase, and an opening rear lid with detailed flat 6 engine. Long list, right? This orange 2,700 piece set with unique serial number is jam packed with detail. Construct this flying aircraft carrier with 2 runways, micro-scale Quinjets, fighter jets and ground support vehicles. 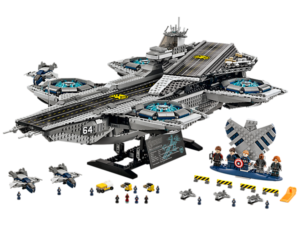 The set comes with minifigures of some of your most favorite super heroes, including Nick Fury, Black Widow, Captain America, Hawkeye, and Maria Hill, plus 12 microfigures to display on deck and within the intricately detailed interior. Mini weapons include Hawkeye's bow, Black Widow's gun and Captain America's shield. A plaque with facts about the SHIELD helicarrier serves as an added bonus to this highly detailed scene. This highly detailed LEGO set features many delightful architectural features including Oriental-style decorated windows and sliding doors, intricate wooden-frame-style walls, and beautiful curved roofs. 12 minifigures are included with assorted weapons: Lloyd, Kai, Jay, Zane, Cole, Nya, Wu, Misako, Dareth, Postman, Jesper and Claire. 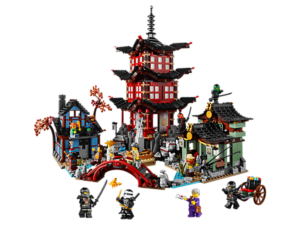 The village itself features the Temple of Airjitzu, a Blacksmith's workshop and Smugglers' Market connected by paths, steps and bridge with 2 stone-style dragons on either side, a statue of Sensei Yang and grass stalk elements. Act out your favorite scenes with this intricate set complete with all six Ninja for the first time. 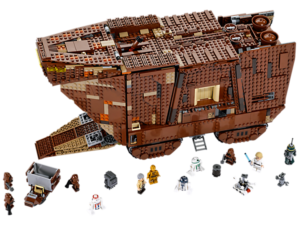 Recreate iconic scenes from giant USA film, Star Wars: Episode IV A New Hope, with this LEGO model of the Jawa's desert-going vehicle, the Sandcrawler. 7 exciting minifugures are included: Luke Skywalker, Uncle Owen, C-3PO and 4 Jawas, plus R2-D2, an R2 unit, an R1-series Droid, R5-D4 and a Treadwell Droid. The vehicle itself features 8 tracks with steering function, a lowering front ramp, opening side flaps, removable top, working cranes, speeder bike, opening hatch for easy access to the boxes, attachable handles for lifting boxes, and a detailed interior including engine bay, storage bay and cockpit. This model features a library, blacksmith, butcher and a marketplace. 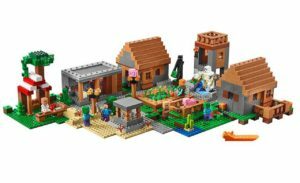 4 minifigures are included: Steve, Alex, zombie and a zombie villager, a Creeper, enderman, pig, baby pig, iron golem, a farmer, and a librarian. Enjoy rainforest, snow and desert biomes as well as a watchtower, library, blacksmith, butcher and a marketplace. Fold out the library and butcher's buildings and lift the marketplace roof to access the interiors. Accessories include a crafting table, water bucket, emerald-ore-style elements, 2 pumpkin heads and a chest with emerald-style elements. Use this 1,500 piece to set your imagination free. 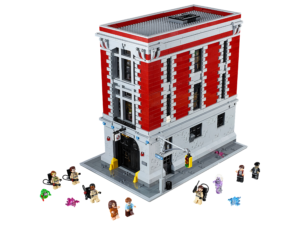 Recreate iconic Ghostbusters scenes with this 4,600 piece LEGO set of the amazing 3-story Firehouse Headquarters. This highly detailed model features a laboratory, containment unit, darkroom, garage bay, office area, kitchen, sleeping quarters, bathroom and recreation room. Use Peter Venkman, Raymond Stantz, Egon Spengler, Winston Zeddemore, Janine Melnitz, Dana Barrett, or Louis Tully to slide down the fire pole, chase the ghosts, and secure them in the containment unit. Turn the librarian old lady into a scary ghost with the double-sided face and extra wig, run tests on Louis in the lab to see if he's possessed, or suspend ghosts around the building's exterior with attachable transparent arms. Accessory items include an alarm bell, fire extinguisher, computer, phone, toolbox, tools, jars of slimes, magnifying glass, camera, camera rolls, arcade game, toaster with slime, fridge with frozen pizza, milk and cheese, and much more. The options are endless. 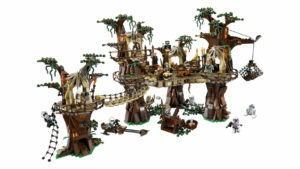 Recreate scenes from Star Wars: Episode VI Return of the Jedi, with this recreation of the Ewok Village on Endor. This model includes a whopping 16 minifigures, including Luke Skywalker, Princess Leia, Han Solo, Chewbacca, C-3PO, 2 Rebel soldiers, 5 Ewoks, 2 Scout Troopers and 2 Stormtroopers along with weapons. Have your characters explore and utilize the tree-trunk hideout and secret lightsaber stash, spiderweb and net traps, slide, catapults, elevating throne, speeder rammer function, kitchen, food storage area, bedroom and planning room. Fend of advancing imperial forces, amaze the Ewoks with your skills, or take refuge in the tree-trunk hideout. With so many scenes and hard to find characters, you'll never find yourself bored or unappreciative of this set. The options for both collection and play are endless. You deserve to own these exclusive sets and enjoy the pay-off after hours of meticulous building. Don't let international shopping barriers limit your choices. Consider using Big Apple Buddy to have your dream LEGO set delivered straight to your door from the USA. Learn more about our service or get a free shipping quote for your exclusive LEGO sets today!